I suspect it’s no secret by now that I have a longstanding love of all things Inhabit. 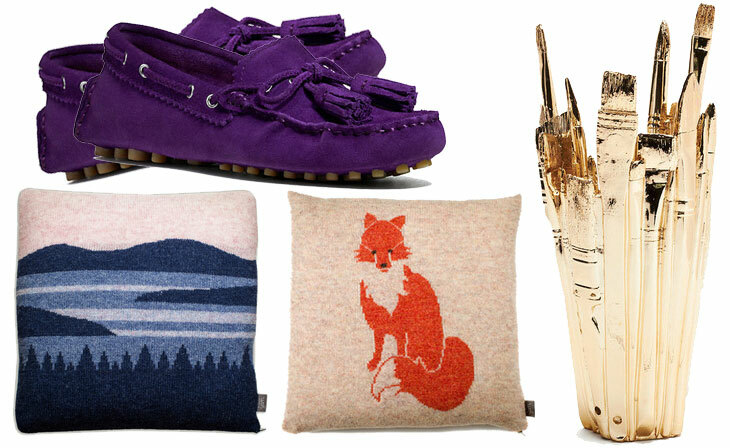 Some brands get my heart for a season, or even a year…but with Inhabit, it’s for life. Their fabrics defy all logic – cashmere that’s somehow both lightweight and sumptuous, cotton so soft that you’d swear it was silk – and their designs always strike that perfect balance between edgy and classic. Smart details like reverse seams and asymmetrical side vents make even a simple cashmere crewneck into a collector’s piece. This entry was posted in interview, styling and tagged coach, dieppa restrepo, inhabit, isabel marant, leigh & luca, MiH, sass & bide on 4 March, 2014 by shoppingsmycardio. This entry was posted in fall, shoes and tagged coach on 10 September, 2013 by shoppingsmycardio. Most of you probably don’t know this, but one of the reasons I started SMC back in my wee baby blogging days was that I’m a chronic overshopper. Give me a task, a specific piece to search for, and I’m like an obsessive-compulsive dog with a bone – I simply cannot stop until I’ve unearthed every possible option, in every possible shape and at every possible price. With a blog as an outlet, that pesky little personality flaw just turns into “content research.” This is why we all need jobs doing what we love. 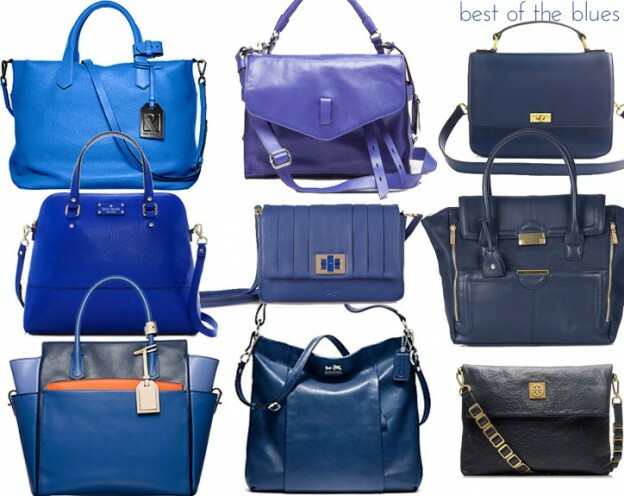 This entry was posted in accessories, handbags and tagged anya hindmarch, blue, coach, cobalt, gryson, j crew, kate spade, navy, reed krakoff, royal, the outnet, topshop, tory burch on 22 January, 2013 by shoppingsmycardio. For some reason, this guide is always the hardest one for me…possibly because part of me thinks this whole blog is one giant style gift guide (isn’t it?). But still, I know we all have that trend-obsessed slave to fashion on our list who feels impossible to please. Take my word for it: your work’s officially done. 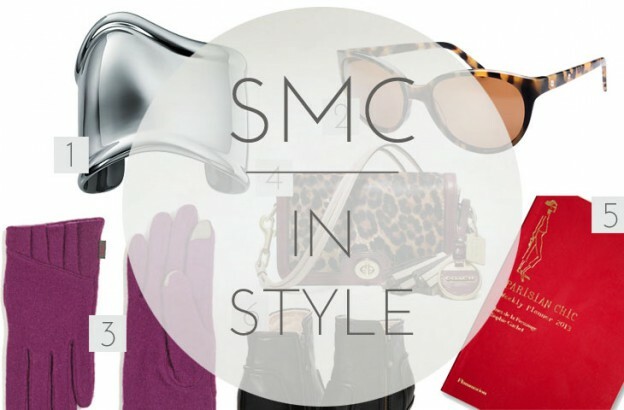 Any one of these gifts is 100% SMC-guaranteed to put a geeky holiday grin on even the pickiest fashionista’s face. This entry was posted in accessories, fashion, gift guide, gift ideas and tagged adorn 512, baggu, boostcase, coach, dkny, echo, frye, kirakira, mezzmer, tiffany & co on 30 November, 2012 by shoppingsmycardio. Kate M.W. ~ As a persistent fan of the statement necklace, but also as one who may often find it hard to stray from traditional favourites, I’m always on the lookout for options that balance the two. 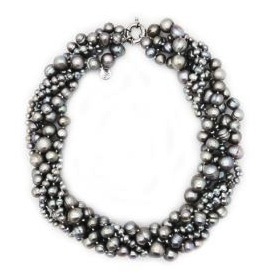 This multi-strand pewter pearl necklace from Hazel & Marie is an excellent way to capitalize on the classic chicness of pearls, and yet truly embrace the ever-so-popular statement necklace. One part unique with the colour of the pearls (something to play well with fall and winter tones), one part classic (as pearls always are), and of course one part bold. A default combination for this necklace would be skinny black pants, an oversized white button-down with a great skinny belt, and your hair thrown up in a nonchalant bun. That being said, the twist on a classic tone of the necklace has inspired something a little different. Though the necklace could be quite dressy, I’m inclined to go with trendy metallic thread jeans (copper and pewter are always an intriguing mix), and a casual grey borderline slouchy sweater with a wider neckline. The idea is to balance bold trendy bottoms with a laid-back top that juxtaposes the necklace. With two relatively bold pieces already in the styling, it wouldn’t be asking too much to make sure that the rest of the details essentially sign up for a non-compete clause. Conclusion? Serious basics. My daytime staples would be a functional full-sized black tote, easy black ballet flats, and my favourite neutral sunglasses. Feel free to swap in basic black heels and a simple clutch for the evening. Either way I’d keep jewelry category streamlined to a cocktail ring and an oversized chronometer, and perhaps adding pewter pearl or subtle copper studs. Polished fall waves work around the clock, and coppery “greige” eyeshadows really set the outfits colour palette. When working with bold statement pieces and yet still holding tight to your favourite staples, treading the line between comfortable and polished is easy if you keep your style all in the details. 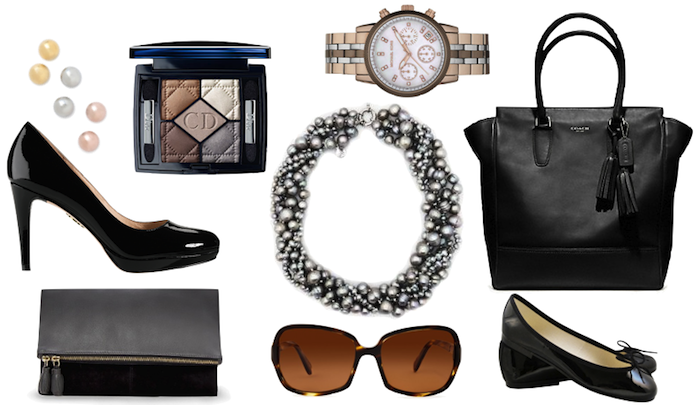 This entry was posted in accessories, guest posts, styling and tagged coach, cole haan, dior, hazel & marie, kenneth jay lane, london sole, mango, michael kors, oliver peoples on 12 October, 2012 by kate. Kate ~ Transition, transition, transition. Every blog, every magazine, everyone discussing fashion for this upcoming season is mentioning transition pieces (…myself included). While the natural thought pattern for transitional accessories normally just turns to the addition of hats and scarves, or swapping neon for deep jewel tones, there’s always the option of allowing the dazzle and sparkle to play double duty as well. Case in point? 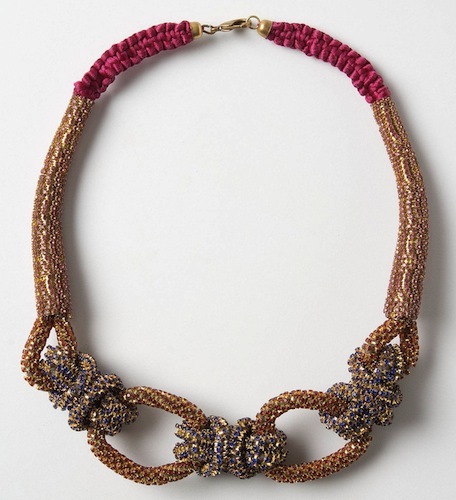 This necklace from Ranna Gill pays homage to to the nautical knots trends of spring and summer, while also feeling readily at home with deep golds and subtle colour for fall (cobalt, maroon and pale pink). It’s substantial enough to pair with a cardigan or sweater, but also not too overwhelming for a t-shirt and jeans. A necklace like this presents a unique opportunity to pair casual with dressy. 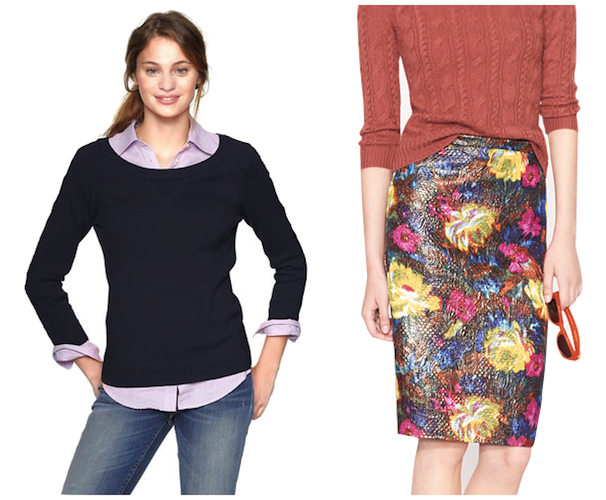 A simple navy sweater that borders on loungewear adds ease to a multi-toned patterned pencil skirt with metallic thread. Because the necklace and skirt have similar colour palettes they complement as opposed to compete with one another. The sweater keeps things from being overly fancy and lends a daytime essence to the outfit. Since there’s a lot going on balancing the necklace and the skirt, your details need to be crisp and unfussy to tone down the overall look. Tiny hammered studs are the only other jewelry I’d suggest, aside from an understated brown leather band watch and perhaps some dainty gold rings. Instead of extra jewels, have fun with a warm medium burgundy nail polish – metallic or creme, you choose! A structured ladylike handbag maintains the feminine tone alongside simple brown ballet loafers. Furthermore all of these pieces will move seamlessly between the seasons as hardwearing staples. Picking pieces that transition from late summer to fall is crucial at this point in the year.. Mixing transition with bold balance (metallic thread pencil skirts and sparkling necklaces) is a fun way to bring the light of summer into a refined fall. Statement and staples, it’s all in the details. This entry was posted in accessories, fall, guest posts, jewelry, styling and tagged anthropologie, brooks brothers, butter london, coach, fossil, gap, gorjana, j crew, stella & dot on 30 August, 2012 by shoppingsmycardio. I have found that WHBM is fairly generous with their sizing and I typically wear a size smaller with them than I would with other stores. Sure enough, one size smaller fit me perfectly through the rear and waist! Cue fitting room happy dance! Unfortunately, even the short length hit at the tops of my feet instead of at my ankle, so I will still have to have them tailored to achieve that perfect ankle-skimming length, but hems are a much easier fix than taking in the waist. To style these, I’d pair them with a classic striped tee (loving the gold hardware on this boatneck from J.Crew! 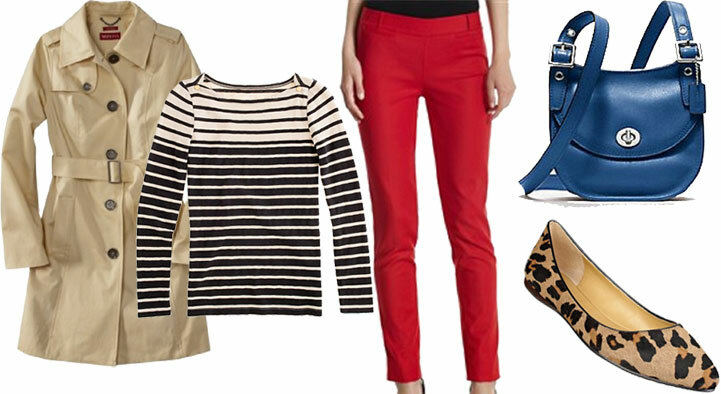 ), some leopard flats, and a bag with a pop of contrasting color – red doesn’t always have to steal the show. Layer on the classic trench you already have in your closet (or snag this super steal from Target) and you’re ready for fall as well. 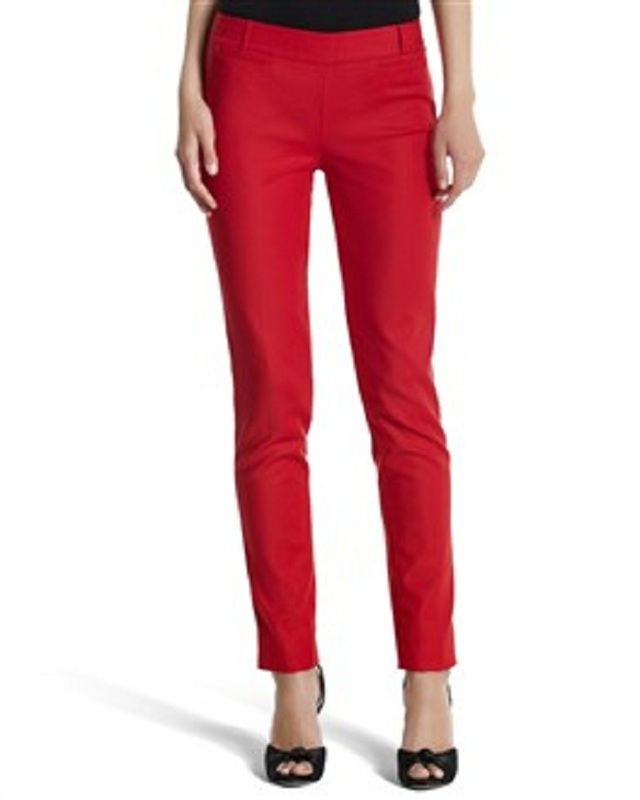 What are your favorite tricks for styling red pants? I’d love to hear your ideas in the comments! This entry was posted in cheap thrills, styling and tagged coach, j crew, nine west, target on 28 August, 2012 by shoppingsmycardio.